To many local residents, the race for the Lassen County District Attorney’s seat is the most important contest in the Tuesday, June 5 Primary Election. Earlier this year, incumbent Lassen County District Attorney Stacey Montgomery announced she would not seek re-election to a second term, and now three local candidates vie for the seat — David Evans, senior deputy district attorney, Susan Rios, senior deputy county counsel, and David Williams, a private attorney. 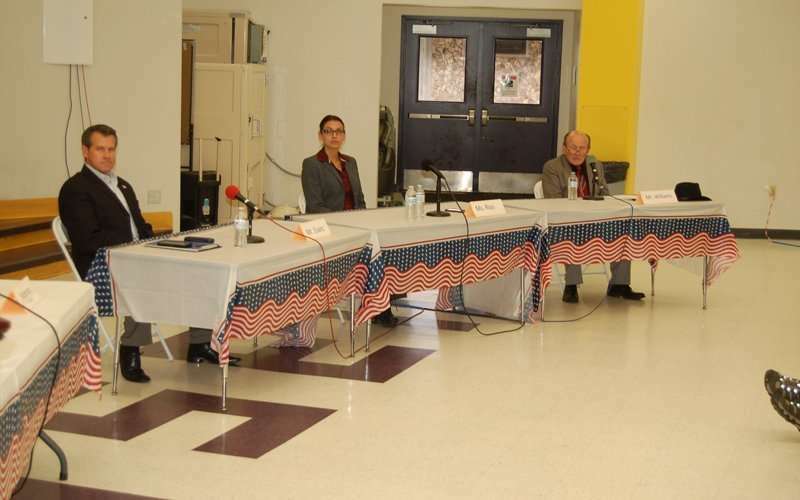 Pat Holley, a Susanville resident who has expressed his concerns about public safety many times, organized the debate held Wednesday, May 16 at the Lassen High Student Center, and he also served as the moderator and timekeeper. Each of the candidates was alloted a total of six minutes for their opening and closing statements. 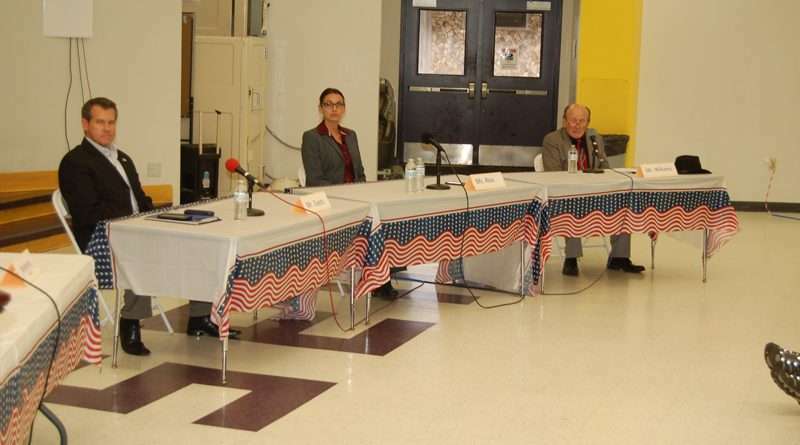 In a round-robin format, Holley asked a candidate a question submitted by the public. That candidate was allowed to make a two-minute response, and then the remaining two each candidates offered one-minute rebuttals. Here are some of the questions and answers. How would you prosecute habitual drug dealers, despite Proposition 47? Evans said he was already strongly prosecuting drug dealers and having great success getting them off the street. He said Prop 47 affects drug users, not drug dealers. He also said the county could refer some cases to the federal government. Rios said she was aware of five current drug cases involving the possession of firearms, and she would seek a more “expeditious resolution” of those cases. Williams said drugs are the underlying cause of most of the crime in Lassen County. Williams said he would work closely with law enforcement to see how to present the best case in court. Biggest changes needed in district attorney’s office? Evans said he would end outsourcing of prosecutions to other attorneys because he would handle those prosecutions himself, saving the taxpayers money. He also would work on training the staff and cooperating with law enforcement and victims. Williams said the greatest change he would make was, “organization, organization, organization.” He said he heard the charges in one recent case were dismissed after a jury had been empaneled and later refiled because of the DA’s errors. Do you support Measure J, the sales tax proposal? Williams said he didn’t believe Measure J was in the best interests of the citizens. He said if the proposal said where the money was going, he might be able to support it. He added the advisory vote wasn’t binding so it meant nothing. “Advisory isn’t worth the paper it’s written on,” Williams said. Evans said the lack of money was a big problem for the county. He said he thought it was a shame the supervisors didn’t listen to the community’s call to earmark the increase revenue for public safety. She said if Measure J doesn’t pass, there will have to be cuts and that includes public safety. She said the voters could hold elected officials accountable at the ballot box if they did not honor the advisory vote. How can plea bargains be used so they don’t endanger public safety? Evans said every district attorney’s office in the state uses plea bargains, and he called them “a necessary evil,” but he said there is a large misunderstanding of what the term means. He said the prosecution often dismisses one count in exchange for a plea on another count when it can’t legally get a sentence on both counts, and that is called a plea bargain. Rios agreed that plea bargains are common, but she said the idea behind a plea bargain is that it’s a compromise where both parties walk away thinking they got the best they could get from the deal. According to Rios, county residents have recently seen plea bargains that heavily favor the defendants and not the prosecution. She said plea bargains should be crafted so they’re economical, but they also must serve public safety. What cases would you personally handle? Williams said he would handle the most serious cases himself and make sure all the cases were ready to go. Evans said he also would handle the most serious cases because he’s the one with the experience, training and qualifications to do so. Rios said she agreed with both Evans and Williams, and she would take the most difficult cases, but she would pay special attention to sexual abuse cases and child abuse cases because she has a passion for them.